Discussion in 'DEALS, DEALS, DEALS!' started by reutunes, Nov 8, 2018. I know I posted a thread about Cinetools FX libraries before... but Loopmasters have decided to now discount everything by 60% for Black Friday (bit early imho). 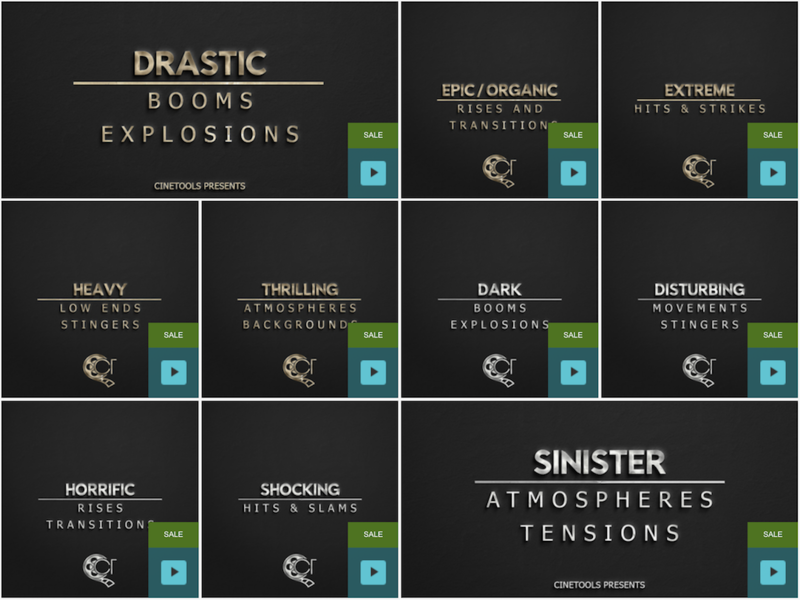 I also noticed that Cinetools have released lots of new "mini" packs which you can grab for as low as £6 each. They're categorised into Low Enders / Booms / Transitions etc. so it's pretty easy to find what you want if you just need a few sounds. ...and the rest of the Loopmasters Black Friday 70% sales are HERE including lots decent stuff from other companies. ChazC, bdev, Sibelius19 and 6 others like this. Not going to list cause you get $ per click on your links? reutunes and AdamAlake like this. The man's gotta make a living! In all seriousness though, the links go where they should (and not to some shady phishing site), and there definitely are too many products there to list. I don't need any of these, but I'll click the link all damn day if it helps. goalie composer, LamaRose, Kony and 6 others like this. Eh, who cares. Reuben brings a significant amount of value-add with his posts. New product announcements, reviews, walkthroughs, sales I may not have heard about otherwise, etc. tav.one, ToxicRecordings, goalie composer and 18 others like this. Cut Reuben some slack, he's a valuable resource on here. He's earning a living like the rest of us, no amount of snarky moral superiority will deflate that fact. Like the person above mentioned, there's that wonderful "Ignore" button if you object to Reuben's innocuous practice so strongly. tav.one, goalie composer, lp59burst and 12 others like this. Seriously. Reuben is a badass as far as I'm concerned. LamaRose, R. Soul, reutunes and 1 other person like this. elpedro, Andrew, devonmyles and 4 others like this. Some interesting stuff, but sadly nothing I'm looking for right now. I'm looking forward to the next two weeks. Bookmarked Galactica some weeks ago, purchased without hesitating ... and some other libraries as well. Can anyone recommend Hell Drums? Those small packs look worth a punt for the price. Yeah they are. I'm really happy they decided to split up the larger libraries into these useful cheap packs. Very specific but they do exactly what they say on the tin. 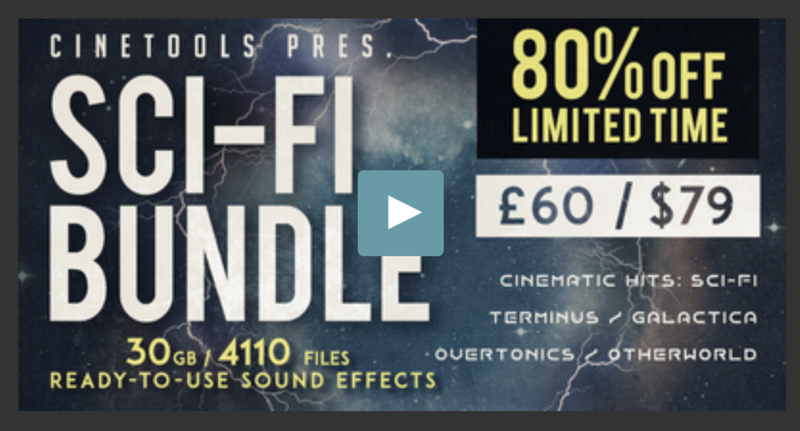 I knew I spoke too soon... Now Cinetools have popped up with another bundle. This time at 80% OFF - crazy times! Their sci-fi bundle is just £60 for a limited time and has almost 30GB of sounds geared up towards otherworldly scoring. As others have pointed out in the past, you can seldom go wrong with Cinetools. The bottom line... I use 'em and they're good. LamaRose, Joe Maron and estolad like this. Reuben is like a trademark at this point... he's been in the game a long time and deserves his due, imho. And I value his opinion/judgement on libraries. lp59burst, goalie composer and Land of Missing Parts like this. Wow - what a compliment! Hey, does anybody know if Steinberg gives discounts on Cubase? I haven't seen any black friday discounts on Cubase specifically. They sometimes do discounts on updates and the mobile version though. ** EDIT ** Cubase 10 has just been released today.